This is Part 2 of my series of reflections on technology and faith. I remember years ago, the American Express company had a marketing blitz with the catchy phrase: "The American Express Card. Don't Leave Home Without It." Created by the advertising giant, Ogilvy and Mather, after the launch of the ad, people automatically remember the connection of the ad to the well-known blue Amex card. Nowadays, it is quite unthinkable to leave home without our cellphones, e-devices, tablets, or digital gadgets. For it contains not only our telephone contacts, the smartphone is our key source of communications, entertainment while stuck in traffic, as well as an important information aggregator and device to update our social media status. For many of us, our daily tagline just before leaving our homes is: "Your smartphone device. Don't leave home without it." Without a doubt, if there is any one object that describes our era, it will be the smartphone. Behind this lies a potpurri of technology products from software to hardware; from communications infrastructure to the ubiquitous wireless waves; from public to personal; from business to leisure; and so on. With technology, many of us feel more advanced, more in touch with information, and more in control of the things we need to know. The question is, are we really in control of technology or is technology controlling us? In Matthew 6:24, we have this master and servant image. If we are the servants. Who is our master? Jesus asks us to choose. Either we choose God or we choose mammon. There is no other. The choice is exactly like what Israel at Sinai had to choose from Moses's multiple choice ultimatum. Believers will of course say they choose God. Yet, mammon lurks around refusing to go away. When you wake up, it is there. When you go to work, it is there. When we play, it is also there. Although many English translations render it as "Money," the Greek word means 'that which one gives allegiance to.' In many societies, "Money" is the single biggest item that people will give allegiance to, which explains why so many people say "Money makes the world go round." I think the word "Money" does not go far enough. For there are many things that compete against allegiance to God. The word is "idols." John in his letter gives this terse warning, "Little children, keep yourselves from idols" (1 John 5:21). That is what "mammon" is. It is an idol. Money can be an idol. A pop star can be an idol. Our jobs can be an idol. In the same light, technology can be an idol. In our world of scientific advancement, many have become so arrogant that they believe with science, they can rule the world. Such pride marks the life of Alfred Nobel, whose interest in science and technological advancement of explosives and weaponry. Alarmed at how his invention can cause so much fatalities, the setting up of a foundation to award Nobel Peace Prizes is a way for Nobel to try to make things right, to seek greater peace even as weapons of war have been created. When something grabs hold of one's heart, that something is in control. How is technology a mammon? Let me suggest three ways. #1 - We have massive amounts of information, but never grow beyond superficial knowledge. We have multiple windows, different browsers, several devices that can all be open at the same time. However, the rush to get our computers working, the Internet running, and the information coming, has locked us into a state where we are more interested in the actual working instead of learning. 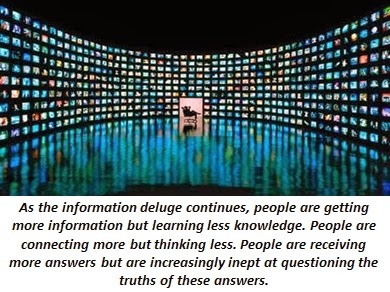 If we look at the way many people handle information, you wonder how much can they actually read. According to David Levy, a Professor and technologist, we may have more information but we have lesser time to really understand them all. There is little depth, no time, and sadly, no reflection. Without depth, without adequate time, and appropriate reflection, how then can we really grow? With high speed computers, super speed internet, and faster mobile devices, we are fast becoming ferocious consumers of bandwidth and digital products. A digital generation is no longer readers but scanners, skimmers, and skippers. Jakob Nielson has been studying online reading behaviour since the 1990s. In 2006, after studying how people read web pages, he concluded that people generally read in a F-letter format for every page. "F" subconsciously means fast. The readers' eyes tend to skip over words and punctuation marks, guided by keywords on the page or catchy items online. Unlike traditional books and printed material, online reading and comprehension is at best 18%. That is why when Nielson was asked about how users read web pages, Nielson replied: "They don't." #3 - We see more but concentrate less. In a Cornell University study, two groups of students are given different conditions while listening to a lecture. The first group was allowed to surf the web while listening to the lecture. The second group cannot surf the web at all. At the end of the lecture, both groups were given a comprehension test. Guess which group did very poorly? Even though I have multiple digital Bibles on my various electronic devices, I must say that I have largely retained the use of printed Bibles. This is especially so when it comes to preparing sermons or Bible studies. Computers are convenient and help me get at the verses fast. However, printed Bibles allow me to slow down and contemplate more. For if I use the computer to study the Bible, I find myself easily distracted by email beeps, clicking alternative windows, or worrying about the battery life. Even if I am plugged in, I am careful not to overcharge my precious laptop battery. So while I try to concentrate on the Bible online, my mind easily wanders to other places. Printed bibles eliminate the worry about intruding applications. They do not even need batteries! My brothers and sisters, how do you do your quiet time? With the observations above, may I suggest the following. As we recognize the potency of technological devices to distract us, do the following three counter-actions. It is a simplified lectio divina, or the spiritual art of reading. A) Shut down your digital devices or silence them. Better still, be electronically free throughout your devotional time. B) Read slowly. This way, you shut the world of rush and let the slow reading of the Word calms you down. Do not let time take charge. Give time for God to move. C) Meditate frequently. Stop. Pause. Reflect on the Word of God. If you are able to do that, you will then be able to speak with conviction: "Technology, you shall have no hold over me. I am your master. You are my slave."